With the 2018 FIFA World Cup coming to a close this weekend–third place on Saturday and the final on Sunday–people are already starting to look to the next World Cup in Qatar. You know, that soccer-rich culture crazy hot Middle Eastern country that surely has at least one soccer ball within its borders. While I am not a fan of people immediately dismissing the moment for the future, there was news that broke today that was eye-opening. 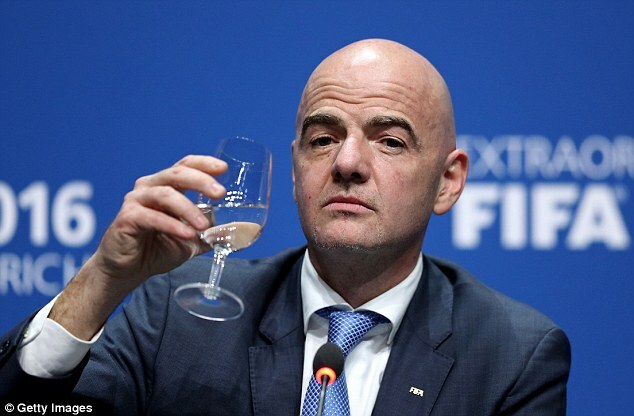 FIFA President Gianni Infantino (Swiss) confirmed that said World Cup in Qatar four years from now will be November 21-December 18. And in announcing the unorthodox schedule for a tournament meant to be played in June and July, Mr. Infantino added this remark. “…of course they will have to adapt” is quite the statement to make regarding a host country whose bid process was a bit shady, to say the least. The perception looked like a cash grab by FIFA and Qatar with accusations of corruption in the voting process. Having traveled to Qatar years back, it’s a nice country and I’m glad I stayed the night, having taken in its burgeoning skyline. It’s sort of a mini Dubai–the new Dubai–to a restrained extent. But when other soccer-rich countries and cultures lost the bid for 2022, that seemed a bit odd. And now the FIFA president has the gall to speak down to the world’s top soccer leagues–steeped in storied history and tradition, as well as world-class talent–to force them to adapt? FIFA should have adapted to the traditional needs of the World Cup and its participating coaches and players in awarding the tournament for 2022. Particularly given the historical fallout via corruption charges waged against former FIFA President Sepp Blatter (Swiss) and Co. in 2015 and FIFA officials concerning the Qatar bid, FIFA has yet to earn back the benefit of the doubt in cases like the 2022 bid. FYI – The road of redemption for FIFA will be long and weighed down in a myriad of heated debates. And it doesn’t help that this road for FIFA is being built to travel through Qatar in November and December. P.P.S. One unresolved issue still under review is whether the 2022 FIFA World Cup will include 48 teams. No, no and no. It may be time for a competitive marketplace of alternative governing bodies to emerge to challenge FIFA and its endless train of terrible, horrible, no good, very bad ideas as conducted by the Swiss. Perhaps it’s fitting this type of news broke on Friday the 13th. It’s not Thursday or Friday. However, that won’t stop a Tuesday Throwback from 2013. There are a lot of soccer fans in the United States of America. And some of whom are casually watching the 2018 World Cup. Many American fans are drawn to teams overseas that they are connected to via a family heritage connection, or because of a favorite player, coach and/or style of play. Example: The United States is my number one team (of course), but I have always been drawn to the fluid and creative total football stylings of the Dutch. Family wise, my lineage is heavily German. Since the U.S. and Dutch failed to qualify for the 2018 World Cup, I am cheering for Germany. Add in the fact that my favorite club team is Bayern Munich and its star German players are anchoring Joachim Löw’s squad. Although, be wary of the French as they have built a great team of veterans and young guns alike. They also play exciting soccer. However, there are still many Americans who are not particularly fond of the beautiful game, don’t have a dog in the fight or are apathetic because they prefer American football. Fair enough. For you, I recommend Coach Lasso. Huh. I actually thought that was behind-the-scenes footage of former USMNT coach Bruce Arena preparing for last year’s World Cup qualifying matches.